Brazilian authorities have found the remains of a 51st victim. Fourteen of these 51 victims have been positively identified, including the captain and one flight attendant. No victims were sighted on between Tuesday June 23rd and Thursday June 25th. Recently, the amount of effort being spent on the search for victims and aircraft wreckage has also been scaled back. On June 23rd, air search activities coordinated by authorities in Senegal were halted. 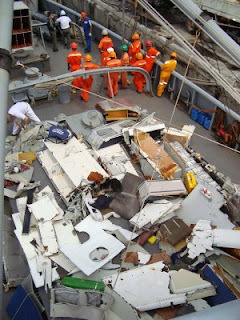 The search for wreckage on the sea floor, especially the black boxes, continues without success. The underwater locator beacons on the cockpit voice recorder and flight data recorder, if they are still operational, will only have power for about another week. After that, finding either recorder will be significantly more difficult. The NTSB is investigating two events involving the airspeed measuring systems of the A330. 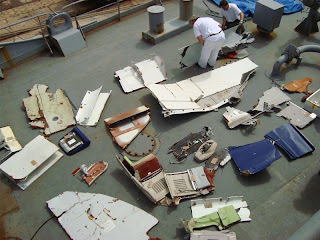 On 21 May 2009, TAM Airlines flight from Miami to São Paulo, Brazil, experienced a loss of primary speed and altitude information during cruise. Reportedly, the flight crew noted an drop in the outside air temperature reading, disconnection of the autopilot and autothrust system, and a loss of speed and altitude information. The flight crew used backup instruments, and airspeed and altitude data was restored after about five minutes. The aircraft continued to its destination of São Paulo. The second incident involved a Northwest Airlines flight from Hong Kong to Tokyo this past Tuesday (23 June 2009). The NTSB stated that the aircraft experienced some kind of problem with its air pressure sensors while over the South China Sea, but they did not provide further details. In both cases the planes landed safely and no one was injured. The failure of these kinds of external air pressure sensors can occur with any airliner, and crews typically have several alternative procedures to work around these kinds of problems. However, these failures may lead to a crash if a flight crew doesn't respond properly. The replacement of airspeed sensors by A330 operators continues. Indian authorities report that the sensors on all A330s operated by airlines in India have been replaced. So far, nothing from the investigation of Flight 447 suggests that jet's pitot tubes were linked to the crash.